BRUSSELS, Dec. 6 (Xinhua) -- An increasing number of world famous Europe-headquartered business giants have been stepping up efforts to increase their presence in China, as Beijing has unveiled an array of new measures to further open up the country's market for foreign investors against the backdrop of a rise of protectionism worldwide. Given the recent experience of those European firms, it is clear that they will benefit much more from China's latest tangible measures of opening its door wider after decades of their business operations in the Chinese market. As China eased restrictions on foreign ownership of auto joint ventures, Munich-based German automaker BMW announced in October to pay 3.6 billion euros (4 billion U.S. dollars) to raise its stake in BMW Brilliance Automotive from 50 percent to 75 percent, becoming the first foreign auto company to take a majority stake in its China joint venture. Also based in Munich, the global insurance giant Allianz announced in November that it has been approved by the China Banking and Insurance Regulatory Commission for the preparatory establishment of an insurance holding company next year in China, a market it has served since the early 1910s. "Allianz is proud to be the first foreign insurer to commence the establishment of a holding company in China -- a significant milestone for us to expand our presence in this strategic market," Allianz Group's Chairman and Chief Executive Officer (CEO) Oliver Bate said. Soon after, the "first of its kind" transaction in the Chinese insurance market was announced by its French counterpart AXA, which plans to acquire the remaining 50-percent stake for 584 million euros (663 million dollars) in the joint venture AXA Tianping to accelerate its growth in China. The Paris-based property and casualty (P&C) insurer said in a statement that "AXA is the first foreign insurer to own 100 percent of a top-20 P&C insurance company in China." In addition to insurers, European banks are reaping benefit as well. The Swiss investment bank and financial services provider UBS was given the green light by the China Securities Regulatory Commission (CSRC) recently to gain a majority stake in its securities joint venture in China. "For the majority of internationally active companies, China is one of the top three markets in terms of sales, profits and investments," said the Association of the German Chambers of Industry and Commerce. For many multinational firms, the calculation behind the decision of expanding investment in China is foremost to share benefits of its deepening comprehensive reforms and ongoing growth momentum. With a global market share of over 30 percent, China, the world's largest chemical market, helps drive the growth of chemical production. "By 2030, China's share will increase to nearly 50 percent, and we want to participate in this growth," Hans-Ulrich Engel, chief financial officer of German chemicals giant BASF, told reporters in November. As the company's largest investment ever, BASF will invest 10 billion dollars in Zhanjiang, south China's Guangdong province, to build a new "Verbund" site to efficiently tap resources, while expanding its site in Nanjing, east China's Jiangsu province, aiming to significantly encourage growth in China. Based on assessment of China's P&C insurance and health insurance markets, which have recorded an annual growth rate of 13 percent and 39 percent respectively over the past five years, AXA seeks to exploit the strong growth potential in the Chinese market. "We look forward to offering high-value products and services to our existing and potential customers in China," said AXA's CEO Thomas Buberl, referring to China as a key growth engine. Sustained market growth means opportunities for increasing revenues and profits. In November, French electrical equipment and graphite-based materials supplier Mersen unveiled its plan to set up a solar joint venture with one of its Chinese partners, and hold a 60-percent stake by investing around 60 million yuan (8.75 million dollars). With the help of the joint venture, the French company expected to generate sales of up to 20 million euros (22.69 million dollars) over the next five years. Apart from the tremendous market scale and sustained growth momentum, it is the continuous improvement of China's business environment and its vision of innovative, coordinated, green, open and shared development that has been attracting ever-increasing foreign investments from Europe. In the latest World Bank Doing Business report, China moved up 32 places in the ease of doing business ranking from last year. "In the global race of scientific and technological innovation, China has shifted from following others to keeping pace and even leading the pack in more and more areas, becoming a globally-recognized fertile ground for innovation and business ventures," Gu Chunyuan, member of the Group Executive Committee of Swiss tech giant ABB, told Xinhua. By announcing a 150-million-dollar investment in a new robotics "factory of the future" in Shanghai and inaugurating ABB Xiamen Hub which involves an investment of 300 million dollars, ABB signaled its ongoing commitment to China, where its investment has added up to more than 2.5 billion dollars since 1992, Gu said. Rather than simply expand manufacturing operations, European high-tech enterprises increase their investment and regard China as a strategic hub, which has taken the lead in innovation, digitalization and green development. 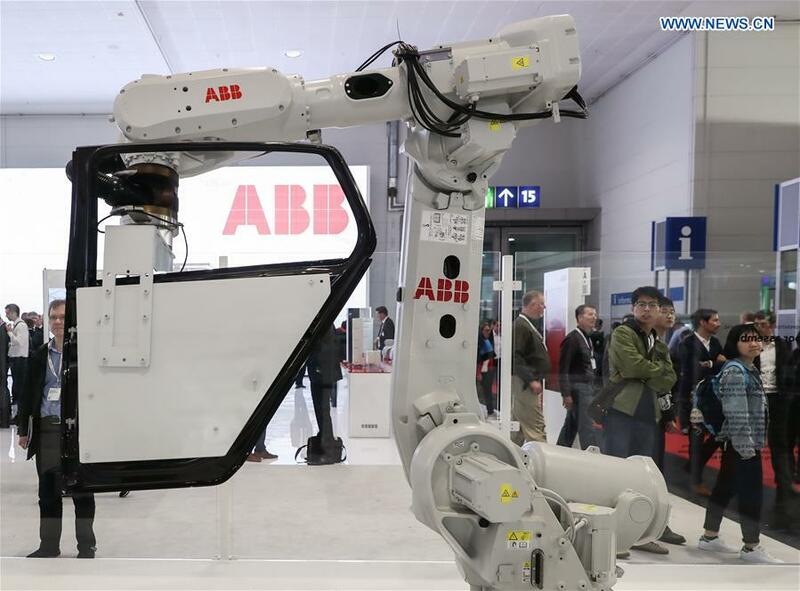 "With a vast global footprint, industry-leading offerings, innovations and extensive experience in overseas project management, ABB has closely cooperated with more than 400 Chinese companies in over 70 countries and regions," Gu told Xinhua. "We will stay true to our long-term commitment of 'In China, for China and the world,' and expand investment based on our existing success to fully support China's economic development," he added.